HomeMTNCheck Out - MTN Introduces Free 4GB Data on 4G Sim Valid for 3months. Check Out - MTN Introduces Free 4GB Data on 4G Sim Valid for 3months. MTN Nigeria has officially launched new offer which gives some users free 4GB awoof data valid for 90days without the need of recharge via air time. The offer is only main for those who get the new MTN 4G sim card, which is now available everywhere. 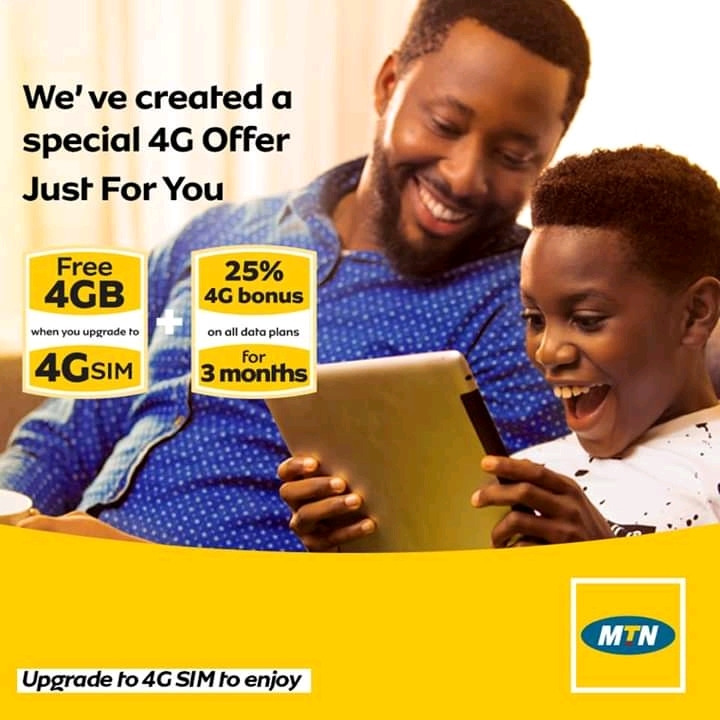 At the same time, please note that not all devices are eligible for the new MTN 4GB Awoof data except those smartphone with 4G or Lte connectivity only. So in this case, if you notice your smartphone has 4G or Lte connectivity quickly get an MTN 4G sim with just N200 - N300 outside there. Apart from the free 4GB awoof data, Customers will also have the great opportunity 4GB data at the rate of N1000 by dailing *131*65# valid for 30days and also enjoy 25℅ of any data they purchase during the day. If you're using an MTN sim which is not 4G, you can quickly walk through any MTN service Centre to swap your sim to 4G. Please before swaping make sure you're using 4G Device to enjoy the offer. Thanks.